Some customers began receiving word on Wednesday that their new Apple TV set-top box has shipped, with delivery even scheduled for a day early. 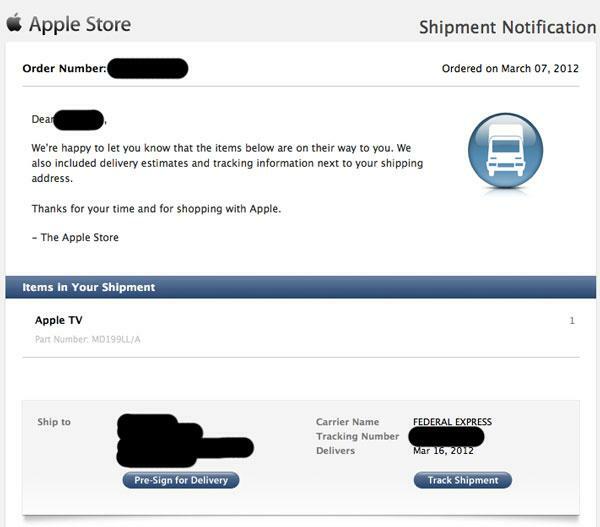 One AppleInsider reader sent a copy of their shipment notification for a new Apple TV they ordered last Wednesday, after it was officially announced. The living room media player sells for $99. Apple's e-mail states that the package will deliver on March 16, but FedEx's own tracking information shows the item is scheduled to be delivered in the U.S. a day early, on Thursday. The new Apple TV will officially go on sale this Friday, the same day as the new iPad. The new Apple TV, announced last week, outputs high-definition 1080p video, thanks to a new custom single-core A5 processor found in the device. To support this functionality, 1080p content is available on iTunes, and the Netflix Instant Watch application has also been updated. In addition to Netflix, 1080p content available on the new Apple TV includes iTunes movies and TV shows, Vimeo, and photos. Apple has also updated its iTunes in the Cloud functionality, allowing customers to play movies and TV shows bought on the iTunes Store instantly on their Apple TV. While the tracking info suggests that some Apple TVs may arrive a day early, customers who ordered Apple's third-generation iPad are probably less likely to receive their delivery early. Though shipments for the earliest third-generation iPad orders went out last week, the packages remain in holding ahead of Friday's official launch.